The probability of a risk event occurring is often a function of the distance to the hazard, which itself is usually a random variable. For example: the risk that a house will be consumed by a wildfire within some period is related to the distance of the closest fire that occurs within that period. 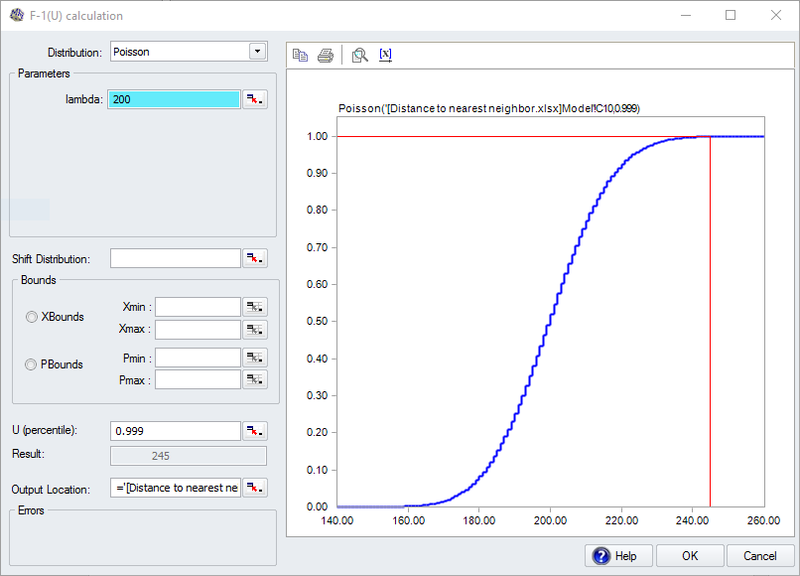 This example model shows how to determine the probability distribution of the nearest neighbor distance. Minimum software requirements: ModelRisk Complete edition. This example models the distance from a house to the nearest fire. The scatter plot depicts the idea – hit the F9 key on your computer to see it change. We will assume that fires occur independently, and randomly in time and space at a frequency of 0.032 fires per square km per year. The model is based on simulating the location of a number of wildfires on a square in the middle of which stands the house. The mean number of fires is set to 200, a sufficient size for the model to give quite precise results, and the dimensions of the square is calculated to give this mean number of fires given the expected frequency. The model uses a large number of the Uniform distributions. These have been entered as one array function, which greatly increases simulation speed. The distance calculation for each fire is also entered as an array function for greater speed. The model takes about 4 seconds to run 5,000 samples. 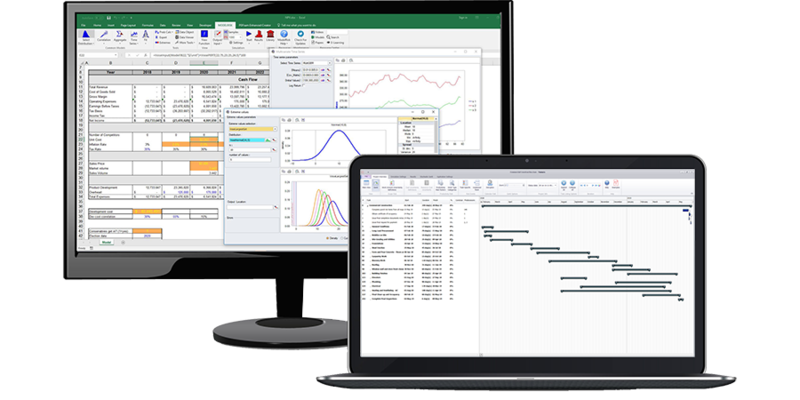 It is set up to directly show two reports within the ModelRisk ResultsViewer at the end of the simulation, which are described below. We could directly calculate any value on the cumulative probability curve – for example, the probability that the distance is less than x is given by VoseRayleighProb(x,b,1) and the distance we are 90% sure the nearest fire will be further than is given by VoseRayleigh(b,1-0.9). 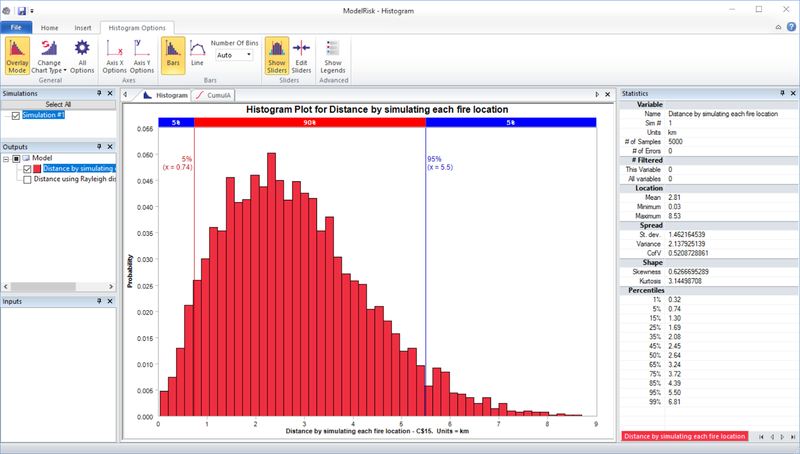 ModelRisk can be used as a tool for probability modeling, not just Monte Carlo simulation. 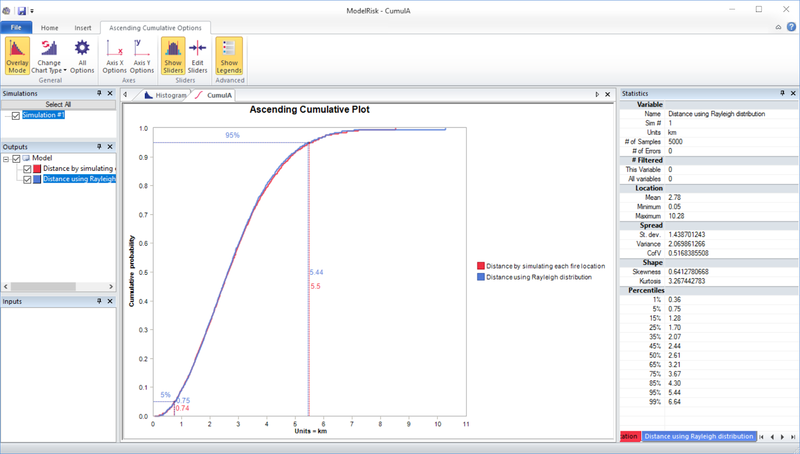 If you are familiar with probability theory, ModelRisk offers hundreds of functions for probability calculations.